Announcing an upcoming opportunity for young women in CPS high schools to engage in a memorable, hands-on learning experience. Exelon is partnering with the United Nations Women #HeForShe program to spark interest in high school girls in STEM education and careers. They are looking for female students currently in 10th and 11th grades to participate in this unique experience. Accepted students will first participate in one or both free interactive STEM Saturday Sessions on April 28th (at the Shedd Aquarium) and May 5th (at Brookfield Zoo); they can accommodate 75-100 girls at each Saturday session. 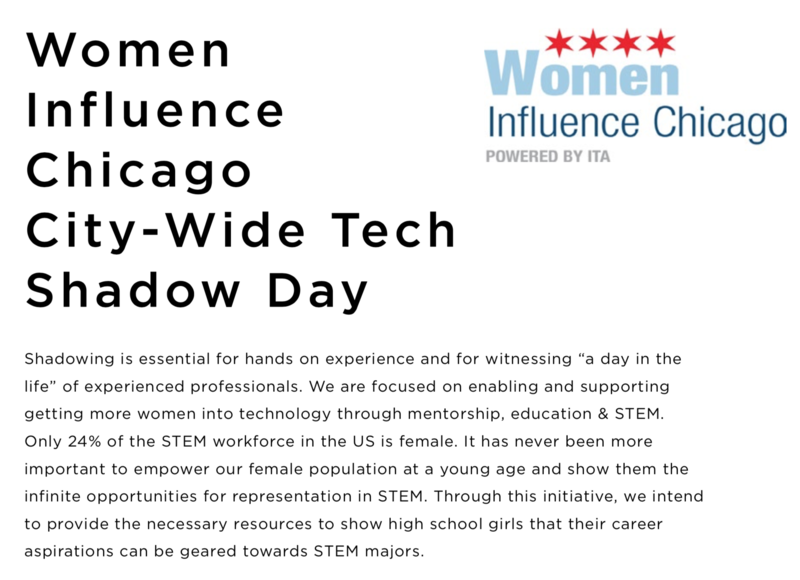 Students also may apply for a week-long residential STEM Innovation Academy for approximately 100 girls held on the Illinois Institute of Technology’s campus July 15-21. All programming is free to students and a select number of students will earn college scholarships through their participation. Please see the attached flyer for details including a link to the online application. Flyer attached. If you have any questions, please do not hesitate to reach out to Jessica Mahon (info below). The application deadline is April 4, 2018. CS @ ILLINOIS Sail is an annual event that introduces high school students to computer science and student life at University of Illinois Urbana-Champaign. This year, it will take place April 7th from 9AM-6PM at Siebel Center. The event is completely free to students, and we will offer transportation to/from the Chicago suburbs. Encourage students to register early, as buses will fill up! You or your students can find out more information and register for courses on our website: sail.cs.illinois.edu. We have linked a flyer here (and attached to this post). Please contact CS @ ILLINOIS Sail at cs-sail if you have further questions. See message below from Ben Norris at Midwest Technical Institute / Delta Technical College regarding a scholarship opportunity. I wanted to make you aware of a scholarship opportunity for high school seniors in Illinois. Midwest Technical Institute and our sister school, Delta Technical College, are pleased to announce the 2017-2018 Midwest Technical Institute and Delta Technical College 2018 High School Scholarship Program (MTI and DTC HS Scholarship) for graduating high school seniors. The program will award up to 23 scholarships for various amounts at each of our campus locations. In total, up to 138 students across MTI and DTC’s campus network will receive approximately $804,000 in MTI and DTC scholarship funds. See attached flier for details, and contact Ms. Carqueville at akcarquevill if you are interested. Every semester the Society of Hispanic Professional Engineers (SHPE) at the University of Illinois at Urbana-Champaign invites accepted high school students to spend 3 days on campus to learn about opportunities in higher education and strategies that would help maximize their potential.SHPE UIUC’s High School Visitation Program (HSV) aims to motivate minority students to pursue a higher education and increase the quantity of minorities in STEM fields. HSV will take place from Thursday, March 8th to Sunday, March 11th. Lodging, transportation from Union Station in Chicago, and food will be provided, FREE OF CHARGE. If you would like to find out more about either the Fall (preference 9th thru 11th graders) or Spring (Seniors only) High School Visitation or SHPE|UIUC, please contact SHPE|UIUC’s High School Outreach Chair, Oscar Ortiz, by email at shpe.uiuc.outreach@gmail.com or by phone at (312) 933-6322. This application MUST be completed by Thursday, March 1st, 2018. However, students are strongly encouraged to complete the application as soon as possible. You do not need to accept your admission into UIUC to apply to the program. If you cannot meet the application deadline and want to partake in HSV, please contact the Outreach Chair as APPLICATIONS SUBMITTED AFTER THE DUE DATE WILL ONLY BE ACCEPTED AT THE OUTREACH CHAIR’S DISCRETION! Once accepted you will receive an acceptance email. Acceptance letters will be send by March 2nd at the latest. If you are accepted, you will receive a confirmation email. If you do not respond to the email or phone call, we will give the position to another student who wants to attend. Don’t miss out on this opportunity to learn about campus life, experience living in a dorm, talk to current students that were in your position, witness a Tesla Coil concert, meet other admitted students like yourself, and much more! Note: You do not have to be Hispanic. The even is simply hosted by the SHPE.